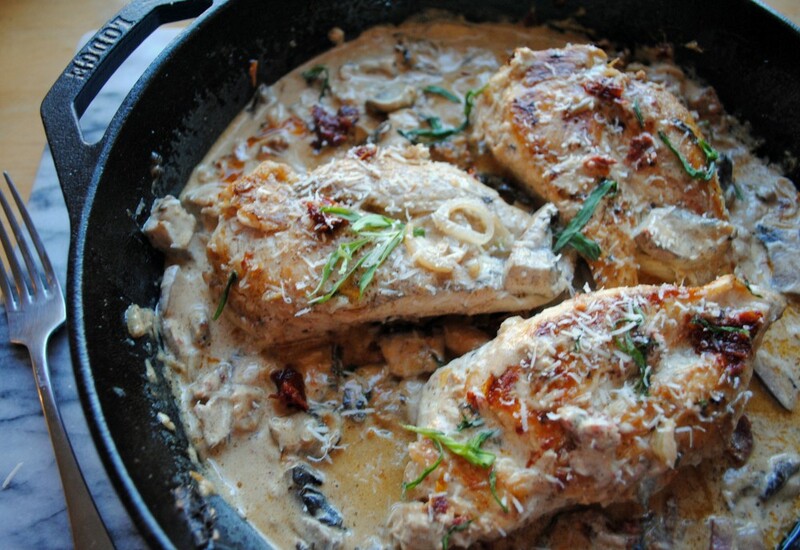 Creamy Sun-Dried Tomato Skillet Chicken. 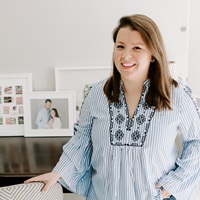 This weekend I was in major need of some comfort after a long string of holiday parties and maybe a few too many glasses of champagne (shh!). My usual go-to comfort food is a bowl of pasta, but I decided to mix it up this time and try a savory chicken dish with a creamy sun-dried tomato sauce, lots of sautéed mushrooms and shallots, and a little crispy bacon and goat cheese just to amp up the richness. Full recipe below if you’re in need of comfort food too! 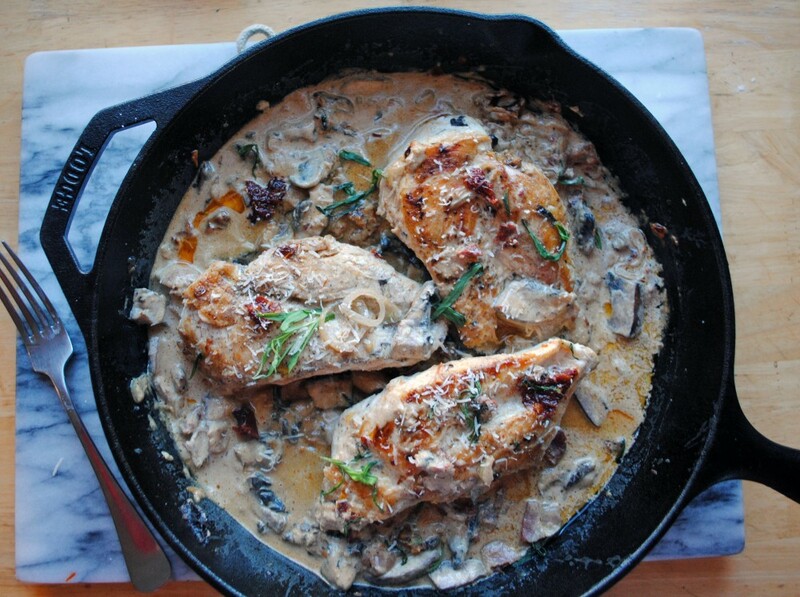 Heat a large cast iron skillet on high and drizzle with olive oil. Season chicken breasts with salt and pepper and brown in the hot pan on both sides. 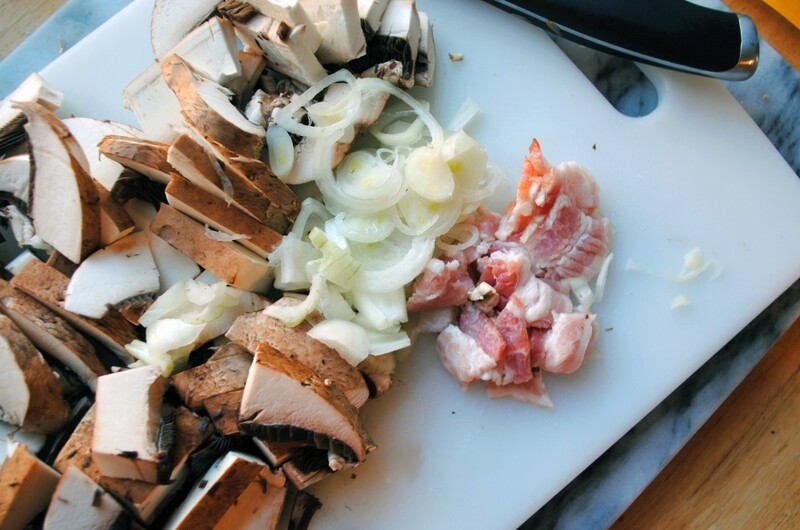 While the chicken is browning, roughly chop mushrooms, shallots, bacon and sun-dried tomatoes; mince garlic. 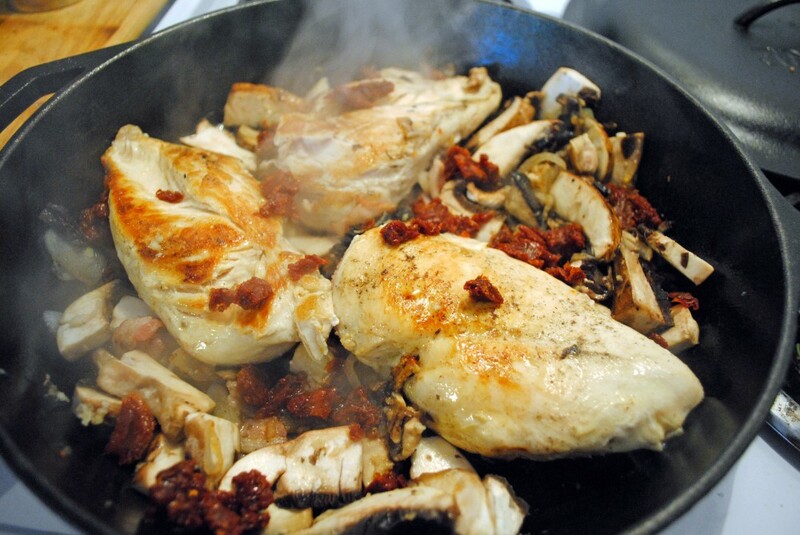 Remove chicken from pan when cooked through, add 1/2 tbsp of the sun-dried tomato oils and 1 tbsp of butter to the pan, then toss mushrooms, shallots, bacon, garlic and sun-dried tomatoes and sauté mixture. (Scrape the pan to loosen any browned bits from the pan). Lower heat to medium and stir in 3/4 cup of light cream, 1 tbsp of goat cheese, and 1/4 cup of freshly grated parmesan cheese; stir continously to break down the cheese and incorporate the tomatoes flavors with the cream. Add the chicken back to the pan while the sauce cooks and thickens. Remove from heat, garnish with fresh parmesan cheese and torn tarragon leaves. Try serving over pasta or a bed of spinach. Jonathan Adler Holiday DIY Event. Neapolitan Rice Krispy Treats. 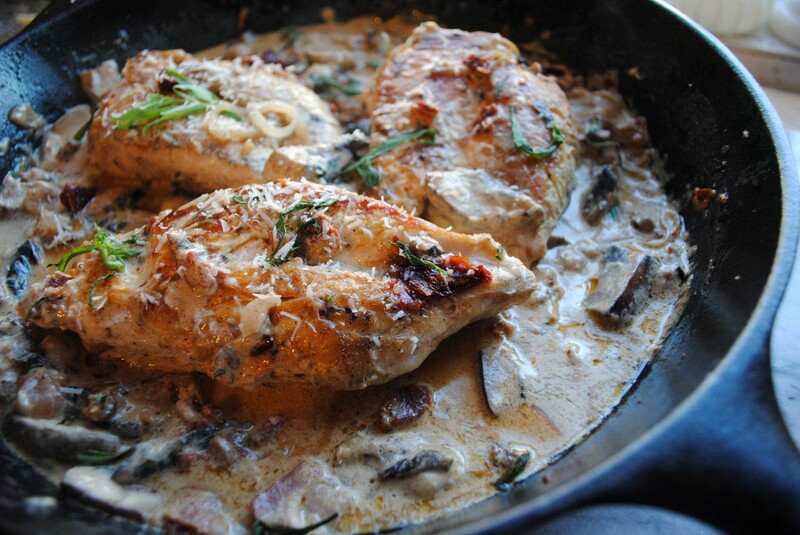 5 Responses to "Creamy Sun-Dried Tomato Skillet Chicken." yum! i am all about the one pot skillet recipes. I made this twice this week. First time with chicken (served over couscous) and then again 5 days later with shrimp (over gemelli). I made a few tweaks I wanted to share but first wanted to thank you for such an amazing comfort meal on these freezing Boston nights. Tonight I subbed chicken with Shrimp, and just used the TJ’s precooked shrimp and heated up a bit and seasoned with garlic and butter to replicate the brown bits the chicken left. Swapped fat free half and half for the light cream and increased to 1 cup to try and stretch out the sauce. 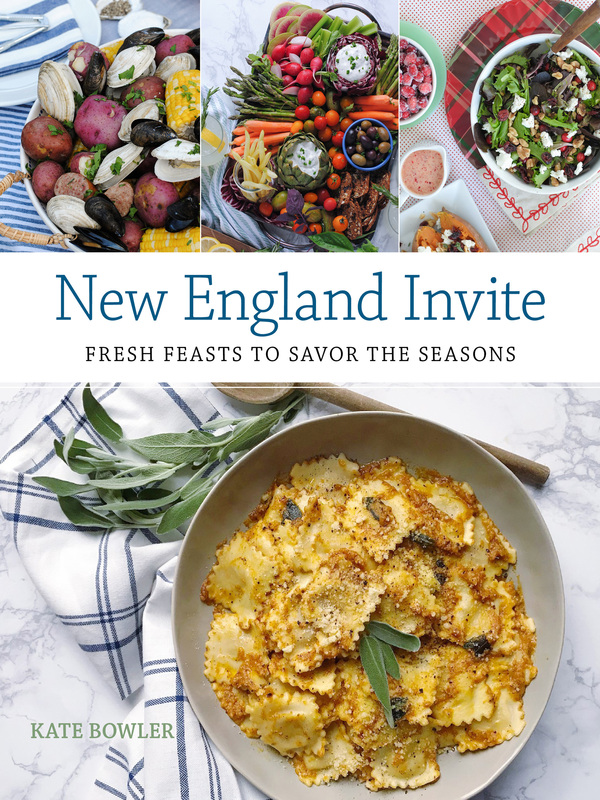 Bacon – I used thick cut but tried the Wegman’s thick sliced maple hickory and the sweet smokiness added such a nice subtle undertone to the dish and served over gemelli. I could not find tarragon – so sprinkled a bit of parsley flakes to brighten for the picture. Love that!! So glad to hear you liked it! Shrimp is such a smart idea!